U.S. Inflation, A Hurdle for the Next Round of Quantitative Easing? The Consumer Price Index (CPI) held steady in November after a 0.1% drop in October. The 1.6% drop in the energy price index and the muted 0.1% increase in food prices helped to hold down the overall gain of the CPI in November. Gasoline prices continue to decline and offset higher prices of heating oil. The core CPI, which excludes food and energy, rose 0.2% in November following gains of 0.1% in each of the prior two months. Higher prices for apparel (+0.6%) and medical care (+0.4%) show the relatively large gains in November. Shelter costs advanced 0.2% in November, matching the increase seen in October. Stepping way from the details of the November CPI report, the big picture is that inflation is not the important story, for now. Inflation has been one of the primary concerns of three members (Fed Presidents Fisher, Plosser and Kocherlakota) of the FOMC who dissented in 2011. At the other end of the spectrum, Chicago Fed President Evans dissented at the November and December meetings because he would prefer additional Fed policy accommodation. 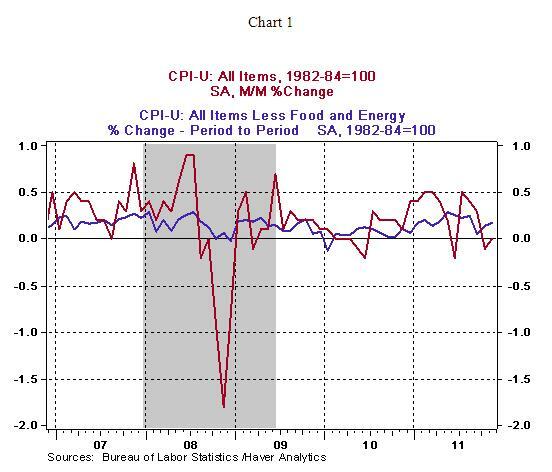 Today’s report on consumer prices and the recent trend of the CPI discredits the anxiety about inflation. During the three months ended November, the all items Consumer Price Index has risen only 0.8% after posting significantly large gains in the early part of 2011 (see Chart 2). 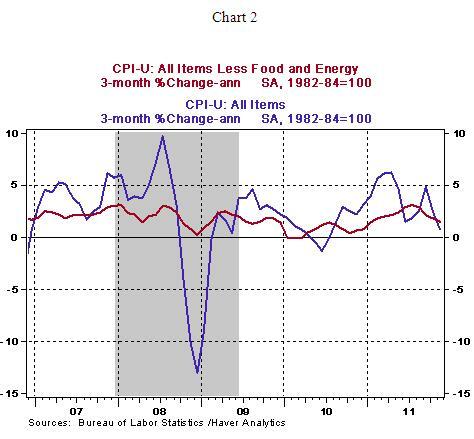 The core CPI, which excludes food and energy rose at an annual rate of 1.45% in November vs. 3.1% increase during the three months ended July (see Chart 2) These numbers suggest that if the Fed is considering the third round of quantitative easing to support the economy, inflation does not present a threat. Breaking down the CPI into two categories of commodities and services reveals the underlying reason for an upward trend of the CPI in the first-half of 2011. 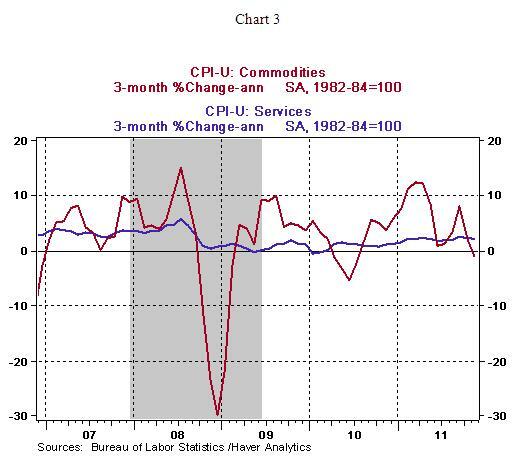 As Chart 3 shows, the swings of commodity prices not service costs tell the story about inflation in 2011. 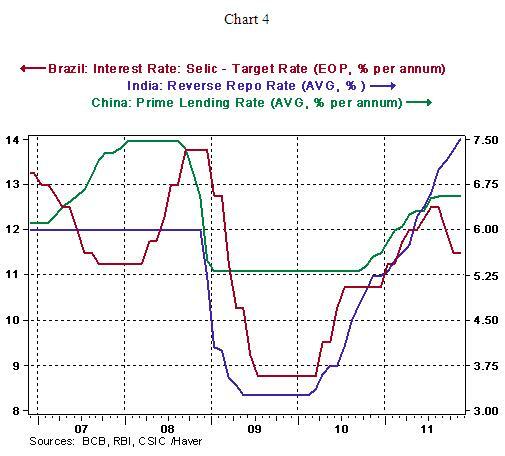 The impact of strong growth in emerging markets such as Brazil, India, and China translated to rising commodity prices in the early part of 2011. Subsequently, monetary authorities in each of these economies stepped in to curtail the pace of inflation by tightening their respective policy rates (see Chart 4). 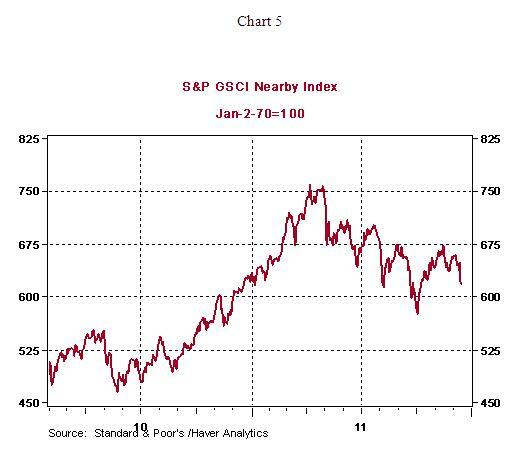 They have been successful in reducing the economic momentum and as a result commodity prices have trended down after the peak in the early months of 2011 (see Chart 5). In other words, inflation in the U.S. economy was not spurred by growth in domestic demand and recent price data attest to this view. 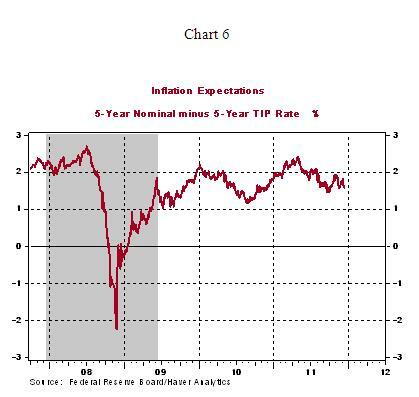 Inflation expectations show a contained trend (see Chart 6) and suggest that worrisome inflation in the near term is not a strong possibility. 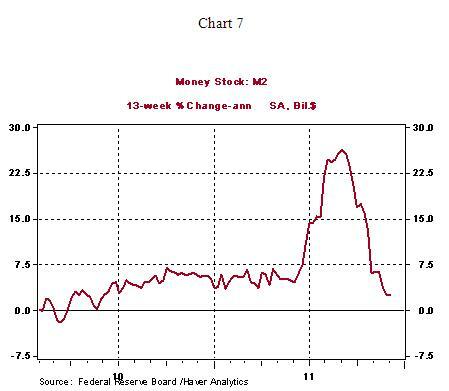 For those who look to monetary aggregates as indicators of impending inflation, M2 in the last 13 weeks shows an annualized increase of only 2.6% (see Chart7). 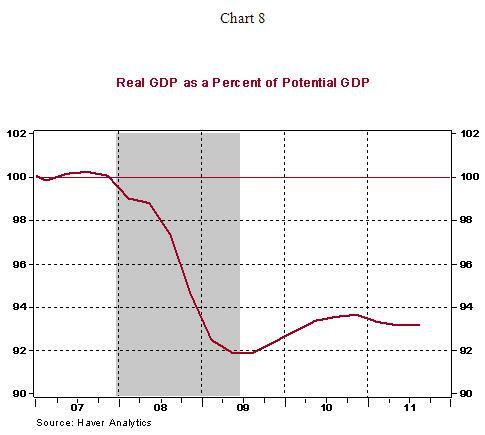 And for the folks who prefer the difference between actual and potential real GDP as an inflation indicator, the yawning shortfall of nearly 7.0% is not indicative of a rapid increase in prices (see Chart 8). The conclusion is that inflation is not an immediate threat and has a lower spot in the Fed’s priority list compared with employment and growth in the months ahead. Asha Bangalore is Vice President and Economist at The Northern Trust Company, Chicago. Prior to joining the bank in 1994, she was Consultant to savings and loan institutions and commercial banks at Financial & Economic Strategies Corporation, Chicago.